The key thing to remember is to go through at High Water SLACK. This is NOT High Water, but about 1hr 40 mins. before it. ( clearance about 100ft.) on the flood tide. However, by the time you come out at Britannia Bridge, you should be thinking of the stream as the EBB out of Caernarfon Bar. The Ebb from the Caernarfon end meets the flood from Puffin at various points along the Straits and creates an area of slack water which passes slowly along the length of the straits. Keep N/E of the pier at Menai Bridge to avoid the strength of the tide, unless intending to pass through at high speed. This is NOT recommended since passage is dangerous to all small vessels except for a period of about 1 hour be-fore slack water ( in either direction ). 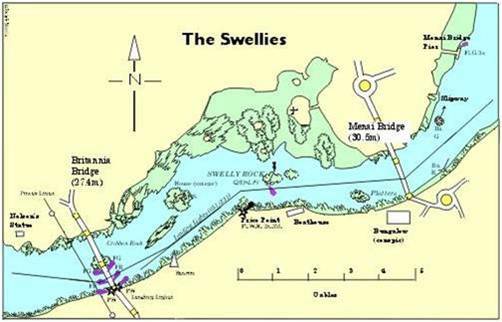 In particular, vessels travelling from the Menai Bridge end of the Swellies at the wrong time of the tide risk being carried to starboard of Swelly Rock. Although a route does exist to the north of the rock and the island with a cottage on it weirs form along the passage as water levels at each end of the Strait differ by several feet during the strength of the tide which can run at 9 - 10 knots. 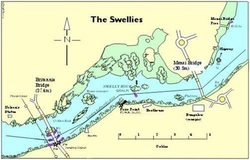 At the right time, the Swellies offer a totally safe passage within the channel shown on the accompanying plan and sketch. Passage is possible at HW Slack and, for most small vessels, at LW Neaps Slack. However, there are depths of 0.5m. at LAT near Britannia Bridge. At HW Slack ( in either direction ), the Platters lie at least 3m. ( 10ft.) below water level, as does the promontory off Price Point. Both may safely be ignored. From Menai Bridge town, pass centrally under the Menai Bridge and immediately adjust course to starboard to put Swelly Rock buoy ( S.Card. beacon, VQ ( 6 ) + LFl. 10s), fine on the starboard bow. As the boathouse ( see sketch and plan ) comes abeam, turn parallel to the mainland shore, to pass about midway between and the shore and the buoy. Immediately after passing the buoy ease to starboard to head for the cottage on Gored Coch in order to avoid the promontory off Price Point. Continue on this course until the leading marks on either side of Britannia Bridge come into transit. These are not always easy to see, being open metal pylons about 4m. high, and positioned close to the bridge buttress. They each carry a fixed light normally lit day and night. Change course to follow the transit until abeam of the triangular white beacon on the shore, then turn to pass under the centre span of the bridge. Complete the passage by heading to the starboard side of the Straits to avoid a buoyed area around an historic wreck opposite Nelson's Statue. With practice you can get through the Swellies with just the one course change, as shown on the sketch and plan. The passage from Port Dinorwic to Menai Bridge reverses this course precisely. Take special care on the leg from the triangular beacon to Price Point because cross currents will tend to force the boat off it's reverse transit. 50 ft. to port. Watch the current. When abeam the boathouse ( and only 50 ft. offshore ) ease to port to leave the Platters to starboard and head for the centre of Menai Bridge span. Once under the bridge keep to the centre of the channel until past the Red post to port. - 0130 hr local HW ( 10 mins. before slack ). For the return trip, arrive at - 0210 ( 30mins before slack ). The difference in timing is because the tide is increasing in speed WITH you after HW slack on the Menai to Dinorwic leg. It will stop your passage after HW slack on the Dinorwic to Menai leg. Passage throuth the Swellies at night is not recommended to newcomers, but there are enough shore lights to make it a reasonably practical proposition.